The Wine Bottle Glass will help redefine the daily wine limit! Indulge in this extra large wine glass that holds a bottle of wine! One glass of wine a day is the usual recommendation, but with this novelty wine bottle, that measurement may need to be recalculated. The phrase etched on the front of the bottle says it all: "Finally! 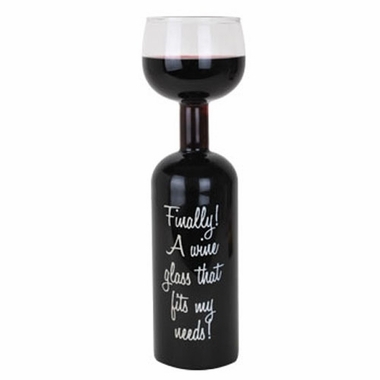 A wine glass that fits my needs!" This wine guzzler glass will be the life of the party! Availability: The Guzzle Buddy Wine Bottle Glass ships within approximately 1 business day.